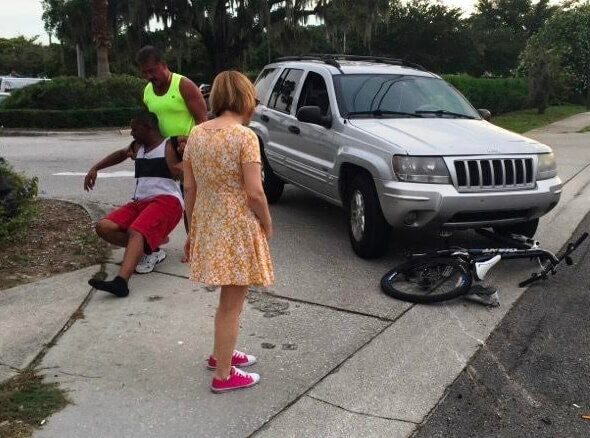 There is finally a small sliver of good news when it comes to Florida’s nation-leading bicycle fatality and injury rate. Annual fatality and injury numbers have come down slightly. Unfortunately hundreds are still dying in the State of Florida. A recently released report by The Florida Highway Safety and Motor Vehicles department concludes that bicycling fatalities were decreased by 9% and injuries were decreased by 6% as compared to 2015. In 2016, 140 cyclists lost their lives in motor vehicle crashes in Florida. 6,234 cyclists sustained injuries. By comparison, 154 died and 6,691 were injured in 2015. One should not celebrate too much. While the 2016 cycling fatalities were less than 2015, the 2016 numbers were still greater than 2014. We have enjoyed only one year of slight improvement. There was one common characteristic of most cycling fatalities in 2016 – as with most every year – cyclists without a helmet are most likely to die. In 2016, 84% of all cyclists who suffered fatal injuries were not wearing a helmet. Bicycle helmets most likely save lives. Cycling at night resulted in more fatalities than in daylight. Although cyclists were hit more often when riding on the sidewalk, these crashes were less often fatal. Cyclists who were hit while riding (illegally) against traffic, sustained more severe injuries than cyclists hit while riding with motor vehicle traffic. With crashes between motorists and cyclists, motorists were found to be at fault about 20% more often. Cyclists riding in bike lanes had lower levels of fatal crashes as compared to cyclists riding in areas without bike lanes. Bicycle crashes with motorists in rural areas were more likely to be fatal, as compared to urban area crashes. 10% of the cycling fatalities involved a cyclist under the influence of alcohol. Cyclists are most often not at fault for causing crashes. Cyclists have legitimate reasons to ride either on the road, with traffic, or on the sidewalk. Both are legal in Florida. Florida should construct bicycle lanes wherever possible. They save lives. Motorists and cyclists must avoid operating their equipment while intoxicated. If you have any legal question about your bicycling accident, please call me at (904) 632-2424 to discuss your accident. As always, consultations are free.